This is a quite different kind of book we review at ThinkerViews. We can rather call it a booklet. It is basically a white paper of their product by Kidguard. No one likes to be monitored or spied on, right? And in most of the cases it is not only unethical but also illegal if not done with per-permission of law and enforcement agencies of the respective area/country. With exception, that you can always look after the people (especially who are minor and as a parent or guardian it is not only your right but also duty to look after their well being). And that is one of the reasons we have decided to go through and talk about this booklet. Another reason is, the availability of cell phones (or mobile phones as we call them often), is getting common nowadays. Rather than just professionals, growing up teens are also getting possession of such devices quite easily these days. And in one way, we can say it is no more luxury anymore, but a kind of requirement these days. A mobile phone is a very powerful device basically. It not only allows you to contact anyone from anywhere, it also have features to send SMS/MMS and a powerful camera. As with every other technology, it can be used in a good and bad way both. As a parent/guardian it is your responsibility to look upon well being of your kid. And if someone is abusing or threatening him/her via this powerful media you need to take precautionary measures for the same. And you may need to monitor his/her device for that. Also the child-trafficking, child-abduction are the problems which are always worrisome. Tracking your kid’s mobile can be helpful to you in such tough scenarios as well. 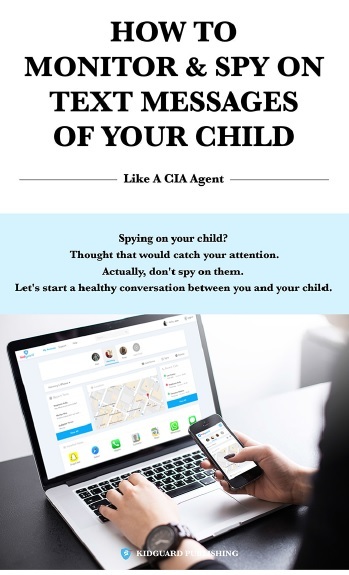 There are many other similar reasons you can think of, in order have a monitoring app installed in your kid’s mobile phone. But again, make sure you don’t use it for any illegal activities, and use it only on target device(s). The book have consolidated the reasons to have such application installed in the kid’s mobile phone nicely. Though there are some representations, but overall a good consolidated list. The book is targeted for all readers (not for only technical ones) so the things discussed are not in depth in terms of technicality. It is good enough however for an average parent for sure. They have listed many applications smartly and have detailed focus on the features of “KidGuard” product. The feature seems promising and if it is working as mentioned, it is definitely worth to go for application. The good thing is they provide a 7-day free demo of the application. If you are convinced with the features, you can go ahead with the subscription otherwise you may not buy it. We haven’t personally tried installing and using the application, so cannot be sure about whether it is working as said, or working outside USA. Thought that would catch your attention. Actually, don’t spy on them. Let’s start a healthy conversation between you and your child. Prevention is better than cure is the universal truth. The kids, when exposed to the technology needs to be taken utmost care. You can monitor their activities and prevent them from being in dangerous situation. Make sure you are not doing anything which is not permitted by law when using such apps. Have you used this product? Only during demo period or extended it for actual usage? What are your findings for the product? Does it live up to the promise? If you haven’t used it, are you planning to use it? Do let us know your thoughts via comments below. Do you want us to provide information about more such products? Let us know. Do you want to receive regular updates of articles published on this website? You can surely follow us on various social networks and join our newsletter.